For me, as an American, one of the strangest things I experienced shortly after we were here was eating mushrooms - not the white kind like we have in the states in the stores (also we have them here) but brown ones - of various sizes, shapes, and textures when cooked. This is a mushroom my husband found today while getting some leaves off the ground! It’s good eating1 He gave it to a neighbor. People raved about them and served them to us when I was too new to Poland to appreciate them. This one will show you how small this mushroom is. Hopefully tomorrow it will be quite a bit larger. they seem to pop up overnight! They tasted slimy to me - and that was mostly what I tasted - texture, not taste, as they seemed to me to be pretty bland. Fast forward many years and what do we have but a forest behind our house and it’s apparently prime mushroom picking grounds! We also have some good places in our yard that have good mushrooms. My husband was able to get our elderly neighbor man to show him good and bad ones and he began to pick them when he saw them - and then my husband would give the mushrooms he picked to our elderly neighbor. I had no real desire to try to fix them. I guess I’m just too American - and I don’t want to die of mushroom poisoning! The season seems to be at its height when we have a wet early fall. And that’s what we’ve had. Here are a couple of mushrooms that my husband found in our yard today. Just to show you the prevalence of these, our dehydrator says, “suszarka do grzybow” on it which means “dehydrator for mushrooms”! It’s what people do. They pick them and then keep them and use especially in the middle of winter for soups and such. At Christmas there are some special dishes they use which call for these mushrooms. The truth was, I wasn’t going to buy them at all - I simply wanted to know what they were worth since people carry their mushroom baskets beside our house on their way to the woods and often return with them full! I left the open market unsatisfied since I just admitted that I wanted to know how much without committing to any amount, and went on. I still have no idea - absolutely no idea - how the price compares to grocery store mushrooms. The interesting thing is, there are very few deaths from people picking the wrong ones. I’m amazed. 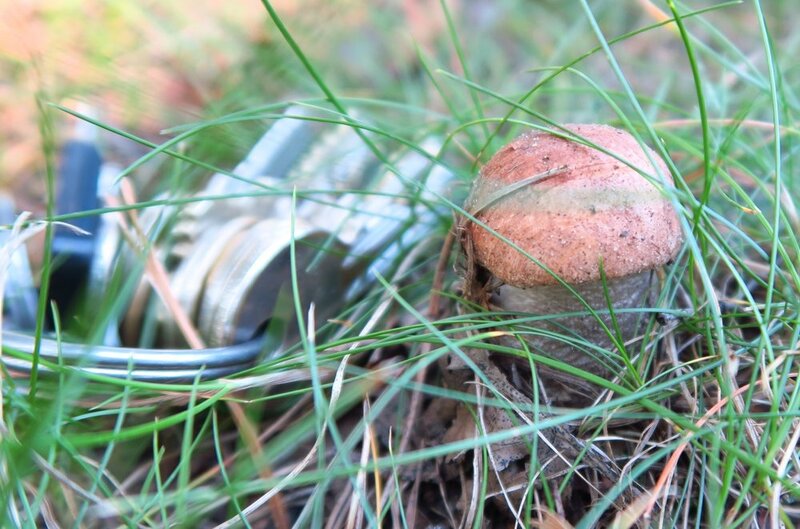 Mushroom picking is a national pastime here in Poland! Have a great day, where ever you are reading this! Beautiful green vines with yellow and gray flowers swirl around on a background of black. Beautiful fabric that portrays gold diamonds with various geometric designs within the diamond shapes. Subtle Golden Quilt Squares are visible on this fabric which has a background of white. Most of the fabric is covered in golden design, however. Beautiful and subtle design on a background of cream. On closer inspection, it actually glows.